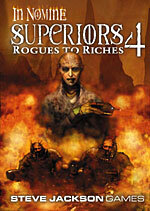 You might think your boss is evil, but you don't know the meaning of the term unless you work for one of the individuals in In Nomine Superiors 4: Rogues to Riches, newly released to e23. This supplement provides insight into five Demon Princes, whose Words cover Drugs, Technology, Secrets, Theft, and Greed. Each Prince gets details on new attunements, Distinctions, and Rites. It also describes these Princes' goals, outlooks, associations, and enemies. Alternate versions are also provided, letting you tweak your In Nomine world as desired with more tragedy or comedy. Finally, it includes adventure seeds to help you use these baddies in your campaign. Sure, you may not like your boss, but at least he doesn't spend eternity lurking in a pit of elemental fire. Or if he does, you should pick up In Nomine Superiors 4: Rogues to Riches anyway; it might include some good survival tips.